infectious disease and microbial imbalances. the Perelandra Essences and items from the Expanded Balancing Kit. 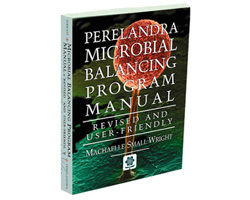 The Perelandra Microbial Balancing Program will change the way you think about microbes, and give you an extraordinary tool for addressing any infection (serious or small) that you may be experiencing with amazing efficiency and success. The Manual is a joy to read and use. It's fun, interactive, easy on the eyes and beautifully designed — it's truly alive and dancing with friendly microbes. • . . . and all you need for motivation to integrate the Microbial Balancing Program into your life! All five sets of the Perelandra Essences — the Rose, Garden and Rose II Flower Essences, the Nature Program Essences and the Soul Ray Essences. These five sets offer the full range of stabilizing needs that is required for you, your body environment and the microbes. For this program, the five sets are offered at a discounted rate in two different size packages. If you already own some of the Perelandra Essences sets, you will only need to add the sets that you are missing. The Expanded Balancing Process Kit containing all the balancers that are needed for microbial balancing work. The balancers address the molecular structure, strength and building needs of the elements being worked with. The Kit includes the Perelandra Soil Balancing Process Kit (seven basic balancers), plus the Balancing Kit II, containing the additional 18 nutrients, trace minerals and vitamins that are recommended by nature for the Microbial Balancing Program. Extra blank MBP Troubleshooting Charts, MBP Phase 1 Testing Charts and blank MBP Telegraph Testing Checklists (can be photocopied by yourself from originals supplied in this manual). Both the Perelandra Essences and the Expanded Balancing Process Kit are used for the balancing and stabilizing needs of your microbes, your body environment and yourself that occur during the program testing. If you are new to Perelandra and don’t yet have any of the necessary items for using the MBP, this may be a large investment for you. We encourage you to purchase the introductory Audio CD ( Microbial Balancing Program Workshop – The Introduction) and this book first. Take time to listen to the tape, read chapters 1–6 of the Manual, and then decide if you wish to use the program and purchase the items needed.